Living in a flat gets claustrophobic sometimes and I long for greenery. As always, I have ambitious plans and a month back, with hope springing eternal in my heart, with notions of verdant creepers and leaves springing from my tiny flat nooks, I employed a gardener. 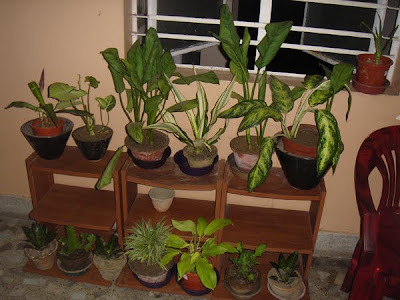 I had 3 pots then, to which I added a Ficus and an Aloe Vera plant. When the sum total of 5 pots was presented to the gardener, he smirked a little. I hoped he too would appreciate my thoughts. Turns out, my gardener works in a nearby mansion in Queens Park and has started adding to my collection by propagating the excesses into my humble pots. Everytime I return home on Tuesday, I find new plants greeting me saucily. Today's addition was the cactii - second from the right and left on the bottom row. Looking at my plants, I feel grounded and peaceful and at home, something that I have never felt before. Earlier, my black thumb ensured that whatever plant I tried to grow, I killed either by over watering or forgetting to water it at all. 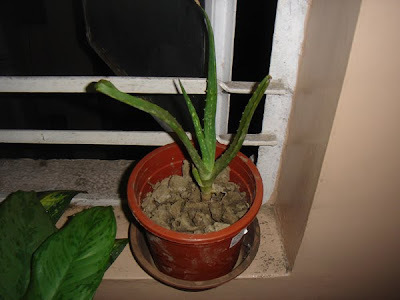 Now, even my delicate Aloe vera plant has a new tendril - that is not visible in this photo since it was taken at 10 in the night. I wanted to grow orchids and have been a frequent orchid murderer. Now, however an orchid fest seems possible. Hey! This looks and sounds real good. "Looking at my plants, I feel grounded and peaceful and at home..."
Plants do have this effect, don't they? I never thought I had a green thumb either, all I used to do was water the plants here. Then little by little, I tried out things I learnt from my mother, from magasines. Now look at me, growing things! One tip I got from a tv show...the inside of the banana skin cleans the dust off leaves and the potassium from the skin is good for the plants. I did it once to a house plant, and boy, did it shine. Don't overdo it though. @LastTrain - Thanks. I love looking at my puny garden/ pots! @Guyana-Gyal - I am always amazed at the peace I get just from staring at my pots. Thanks for the banana skin tip. I shall try it as soon as I get back home!